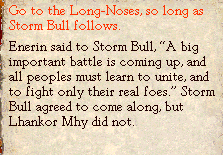 Enerin meets with Oriska, priestess of the Long-Noses, who says, "We have no cause to make peace with the Big-Teeth. They have always attacked and killed us. Our best and finest are murdered. They take our leaders, our priests, our healers, and our weaponthanes." 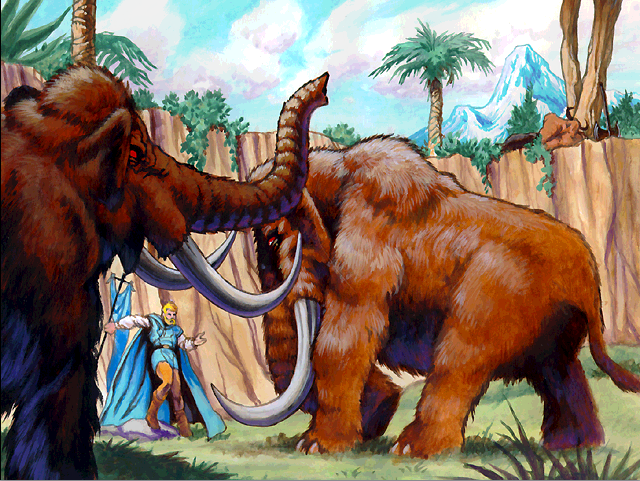 Oriska lowers her voice and, through her enormous nose, whispers a shameful secret: "Then, the Big-Teeth eat them. They devour our flesh and prevent our bones from being interred in my holy, secret place. We can never make peace with them so long as they eat us. Now that the thing called Death has come into the world, it is impossible." -Go immediately to talk to the Big-Teeth. -"I will make them promise to give the chewed bones back, so the Long-Nose spirits will fly free." -"If I cannot make a peace here, the whole world will be in big trouble." -"You must understand that your war hurts the Digging Stick People.